I am currently trying to expand my collection of t-shirts. I enjoy wearing a graphic tee with witty text or fun graphics paired with a skirt; because easy ensembles like t-shirts and jeans are just so yesterday! My favorite tee is a grey crew neck that reads, “I’m not a player, I just blog a lot.” (based on the lyric, “I’m not a player, I just crush a lot.”) I think it sums me up quite well! Fellow bloggers can get this t-shirt at RAYGUN here. 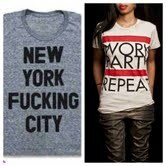 But what I really want to be welcomed into my closet are these two t-shirts: New York F*cking City & Work Party Repeat Please excuse the profanity but I really do love NYC! I found this t-shirt via Bows and Sequence’s blog. And Work/Party/Repeat was stumbled upon via Instagram. For anyone reading this trying to figure out what to get me for my bday coming up, you can get either tee here or here. 😉 Or you can just buy a t-shirt for yourself. That’s cool too!